The M728 is a Combat Engineer Vehicle used by engineering units for construction of defensive positions and demolition of enemy fortifications. It is designed to provide maximum ballistic protection for the crew. 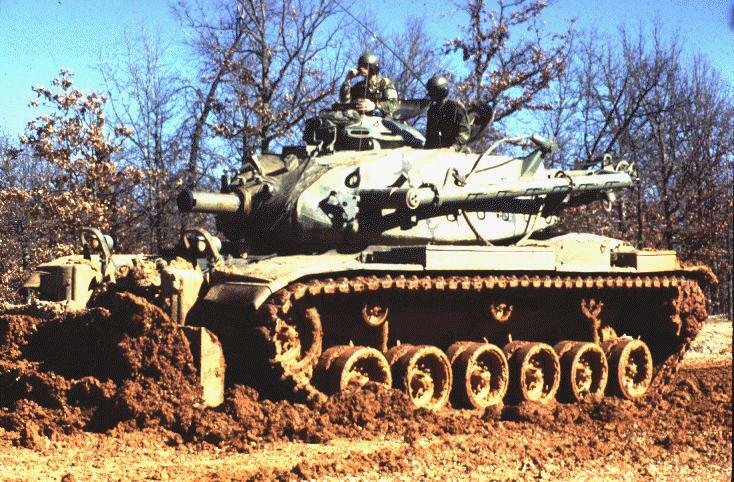 The vehicle is heavily armed, being a basic M60A1 tank, modified to provide a mobile and maneuverable weapon or combat support of ground troops and vehicles. It is equipped with a hydraulically operated dozer blade mounted to the front of the hull. A winch and boom are mounted to the turret for lifting, carrying and winching. The vehicle is used for breaching, obstacle removal, transportation of demolition teams, and pioneering operation. This has the same 152mm gun as the M551 Sheridan. 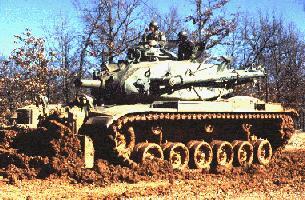 A crew of four operates this vehicle, with the power train and chassis being the same as the M60A3. It saw combat service in Vietnam and Desert Storm. DESCRIPTION: The M728 CEV is a full-tracked armored vehicle which consists of a basic M60A1 tank with a hydraulically operated debris blade, a 165mm turret mounted demolition gun, a retractable boom and a winch. The demolition gun may be elevated or depressed for use at various ranges up to 925 meters and is coaxial mounted with a 7.62mm machine gun. A .50 caliber machine gun is cupola mounted. A mine clearing rake was specially designed and fabricated to be a "tool" for the CEV in Desert Storm. The full width rake allows the CEV to clear minefields in non-cohesive, granular soils. The Mine Clearing Rake is a V-shaped tined plough that performs countermine activities by lifting buried mines with its tines and pushing them to the side as it moves. Attached to a M728 CEV or M60 tank via a Dozer Kit, the Mine Clearing Rake also utilizes an aluminum skid shoe, which protrudes from the front of the tines and allows the rake to maintain a consistent plowing. It clears a path measuring 180 inches wide, accommodating heavy tanks and other armored vehicles. The devices operations are limited to soft sandy soil. Additional features are that it weighs 4000 pounds, and is easily assembled and installed. STATUS: The CEV was placed in service in 1965 with a total of 291 vehicles. Currently improvements for the operations readiness are being implemented. These improvements will ensure that the CEV remains a valuable asset until replacement vehicles are fielded. During Operation Desert Storm the CEV proved unable to manoeuvre with the heavy force due to the inability of the M60 chassis and power train to keep pace with the MIA1. They also had difficulties associated with maintaining an obsolete, low-density piece of eqpt. Many manoeuvre units simply left the CEV behind rather than slow their manoeuvre. Such was the case with the Mine Rake mounted on the CEV. Commanders planned for their use as a part of the deliberate breaching operation, but left them behind once they began the pursuit and exploitation phase of the operation. Commanders were unanimous in their opinion that the engineerr force needs M1 chassis' for heavy breaching and gap crossing equipment. EMPLOYMENT CONCEPT: The CEV provides Engineers in the forward combat area with a versatile, armor-protected means of performing mobility tasks under hostile fire. Tasks include reduction of roadblocks and obstacles; filling craters, ditches and short dry gaps; limited construction of combat trails; construction of obstacles; and clearing of rubble and debris. BASIS OF ISSUE: The CEV is issued two per Engineer Company in the Heavy Division, two per Engineer Company in Corps (Mechanized), three per Engineer Company in Armor/Infantry Separate Brigades and three per Engineer Company in the Armored Cavalry Regiment. TRAINING/PERSONNEL: The U.S. Army Engineer Center provides training during Advanced Individual Training for the Track Vehicle Crewman (MOS 12F), Basic Non-Commissioned Officer Course, Advanced Non-Commissioned Officer Course, Engineer Officer Basic Course and Engineer Officer Advanced Course. At the unit level, training will be conducted on the actual piece of equipment as on-the-job training. Training Extension Course lessons are also available for refresher training at the unit level.